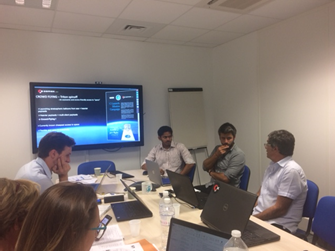 These working meetings gathered SMEs using or producing data in order to provide them some context on markets using these data in countries targeted in the project and to exchange on their activities and feedbacks. South Africa: fishery, maritime security, coastal hazards. Of course, a product or service using observation data and addressing a market not mentioned above could be regarded through our initiative. An action plan is under development in order to definer the required steps for SMEs internationalisation in the sector. The actors in the sector or interested, notably SMEs, will be requested very soon for showing their interest in the project and their will to export outside of the European Union. If you have a product or a solution using or allowing Earth Observation data recording for maritime applications and you consider to export in one or several of the mentioned countries, contact us. SpaceWave is an European project aiming to realise an SME internationalisation strategy in order for them to reach markets related to Earth Observation data use, applied to maritime topics, in non-EU countries. This project is funded under COSME programme. SpaceWave project is a 1st phase. As the result of this project, partners intend to submit an answer to another call for proposal which will concretize the SME support towards identified countries and key markets in SpaceWave framework.